What is different about the careers of people like Lou Gerstner, the acclaimed, recently retired chairman and CEO of IBM? Or Senator Elizabeth Dole, Yahoo! COO Dan Rosensweig, and Tom Freston, chairman and CEO of MTV Networks? Why did they ascend to the top and prosperwhy did they have extraordinary careerswhile others equally talented never reached their potential or aspirations?Jim Citrin and Ri… ck Smith of Spencer Stuart, the worlds most influential executive search firm, set out to explore this question. The resultbased on in-depth, original researchis sure to be the most important and useful book for anyone seeking to crack the code of how to build a rewarding, personally satisfying career.Like weather systems and financial markets, careers contain patterns. 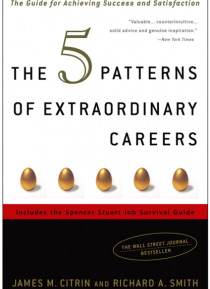 What Citrin and Smith found from their research and extensive experience is that people with extraordinary careers are guided by five straightforward patterns that can be harnessed and used by everyone. These individuals: Understand the value of you by translating their knowledge and experience into action, building their personal value over each phase of their career Practice benevolent leadership by not clawing their way to the top but by being carried there Solve the permission paradox, the dilemma of not being able to get a job without experience and not getting the experience without the job Differentiate using the 20/80 principle of performance by storming past their defined jobs to create breakthrough ideas and deliver unexpected impact Do not micromanage their careers, but macromanage them by gravitating toward the things they are best at and have a passion for, and working with people they like and respectNo one manages your career for you. But with Citrin and Smith as your guide, youll be able to understandand act onthe root causes of success. And what better source for strategic career advice than Spencer Stuart, the firm that over the past ten years has conducted more than 60 percent of the searches for Fortune 1000 CEOs?